This recipe was inspired partly by Luisa Brimble (in my opinion the top food photographer working in Australia right now), who was writing about Filipino food a few days ago and how coconut milk is often used in savoury dishes that aren’t curries. I had already written down the concept and recipe outline for this dish, but hadn’t yet decided on the exact spices and flavourings that would go into it. 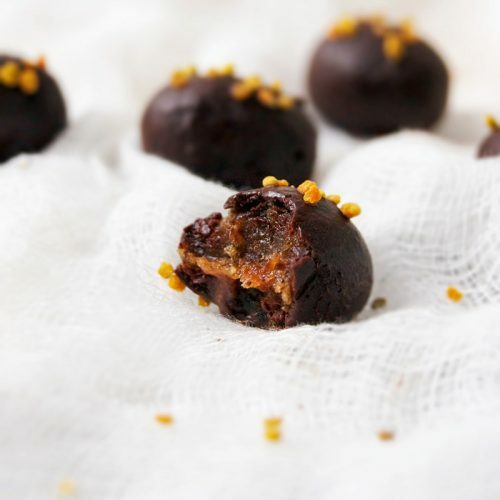 I use coconut milk frequently – often in a vegetable curry, but most often for sweet uses; dairy free ice cream, as the base for a vegan chocolate ganache, coconut whipped cream, or in rice pudding instead of whole milk. The flexibility and high fat content of coconut milk make it invaluable in plant based cooking and baking, replacing cream whenever I’ve needed it. I had thought coconut milk might be too sweet to use in a dish like these coconut rice noodles without several different spices to balance it out. I was wrong. 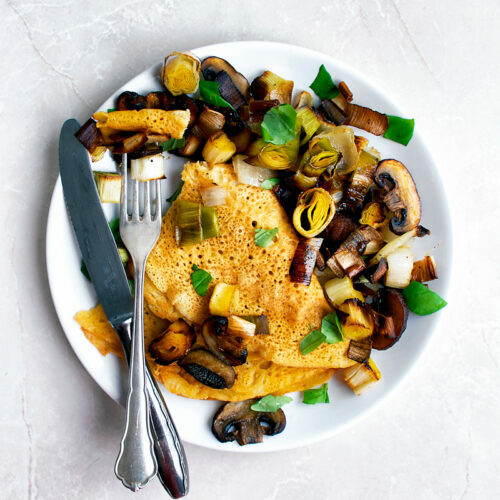 A good bit of fresh ginger, along with garlic, onion, and piles of green vegetables, provide a good counterpoint to the natural sweetness of coconut, without the need for earthier flavours like cumin or turmeric. The ingredients used here are widely available at this time of year. 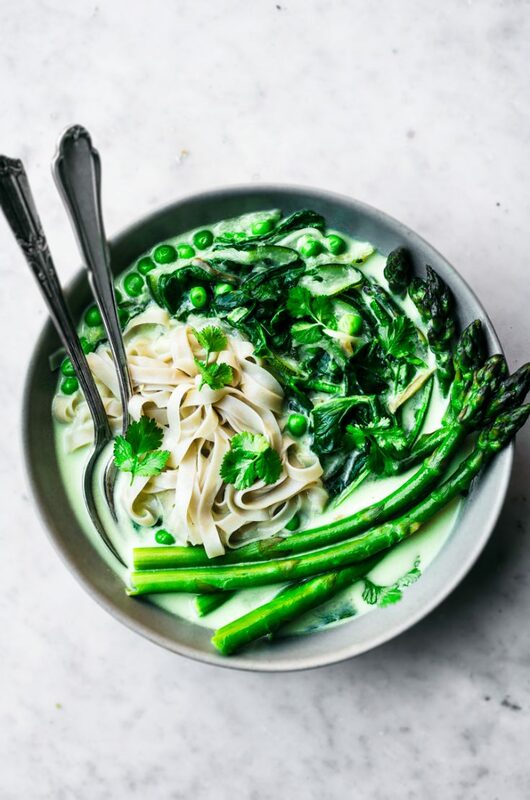 Any green spring vegetables will be good in these coconut noodle bowls, but I think the asparagus is key, and adds a lot to this dish. Snap peas, green beans, broccoli, pak choi, beet greens, just about anything green can be used. My choices were based on what’s easily available to me right now and the short cooking time needed. You can have this made, from start to finish, within about 15 minutes. Rice noodles need just a two minute soak in boiling water, and the veg also cook for a couple minutes in the coconut ginger broth. A very short cooking time for the zucchini and asparagus, plus adding the peas and spinach after taking the pot off the heat, keep the greens vibrant and snappy. No limp veggies here, please. 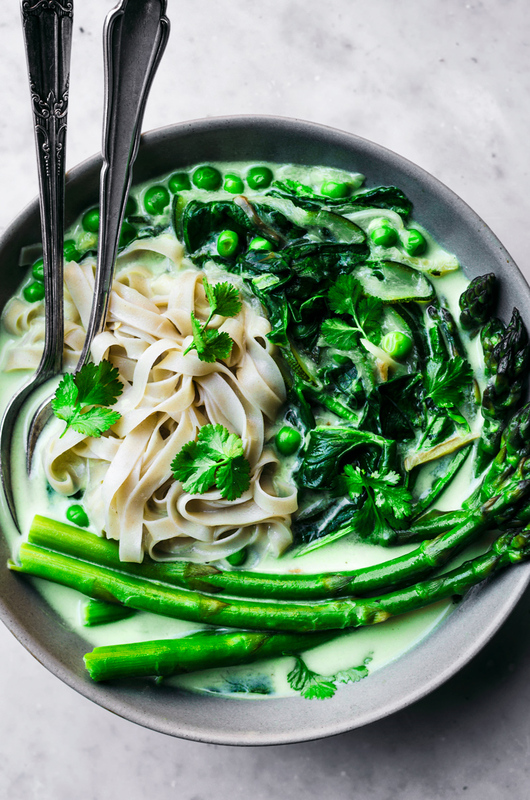 It’s a bit of a combination of a soup and a creamy noodle dish – which is why you see both a fork and spoon in that bowl – and a nice light spring dinner for weeknights. The broth takes on a slight green colour from the vegetables and it really feels like a proper spring meal. A little cilantro on top adds to the savoury element here and a squeeze of lemon juice adds some much needed acidity, so don’t leave it out. Lime juice would be just as good. A quick note on rice noodles. I used gluten free brown rice noodles, and don’t notice a difference from regular white rice noodles. If you can find them, give them a try, or use another whole grain rice noodle. Other types of pasta can be used but won’t have as short of a cooking time. 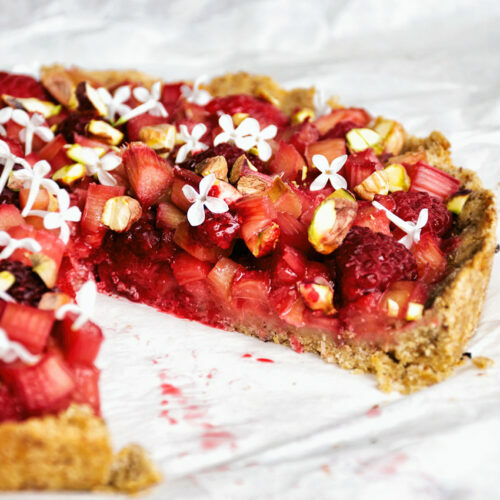 If you’d like some more spring inspiration, check out my vegetarian dinner ideas for April and spring recipe archives. 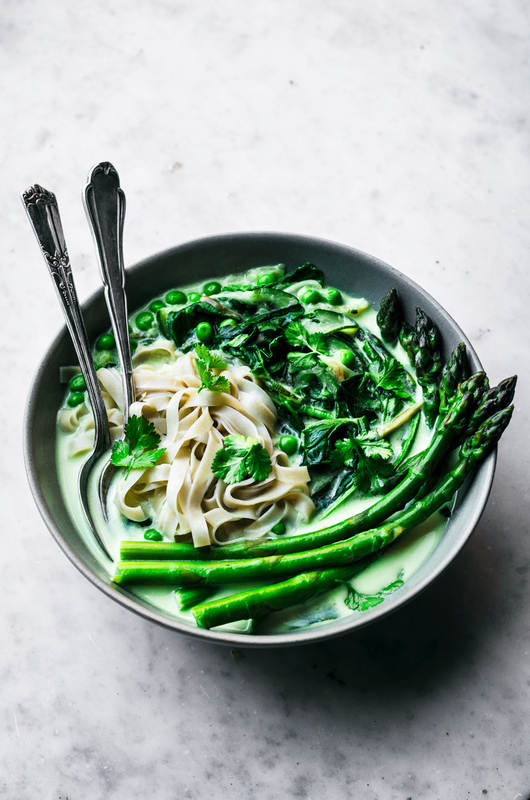 These healthy coconut rice noodles are packed with spring green vegetables like asparagus, spinach, peas, and zucchini only need about 15 minutes from start to finish. Vegan, gluten free (with brown rice noodles), and with a creamy coconut milk ginger base. In a large pot, heat the oil over low-medium heat. Add the onion and sauté for a couple of minutes, or until softened and fragrant. Add the garlic, ginger, and zucchini, cook for another minute, then stir in the spices. Pour the coconut milk and vegetable stock into the pot, cover, and increase the heat to high to bring to a low boil. Prepare the rice noodles according to package instructions while you're waiting. 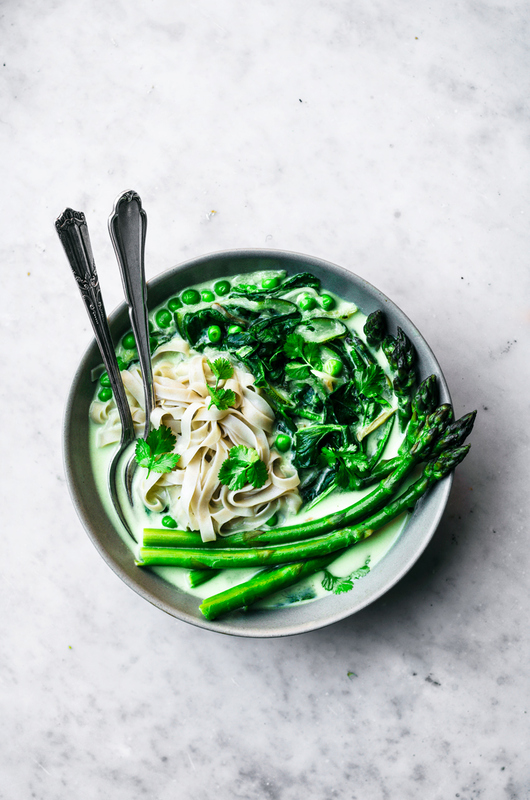 Once the broth has reached a boil, reduce the heat to medium and add the asparagus, cooking for two minutes, or until the asparagus is bright green and just tender. Remove from the heat and stir in the peas and spinach. Cover for a minute to let the peas thaw, then ladle out into bowls and add the prepared rice noodles. Top each bowl with a squeeze of lemon juice and a few cilantro leaves, and serve hot. 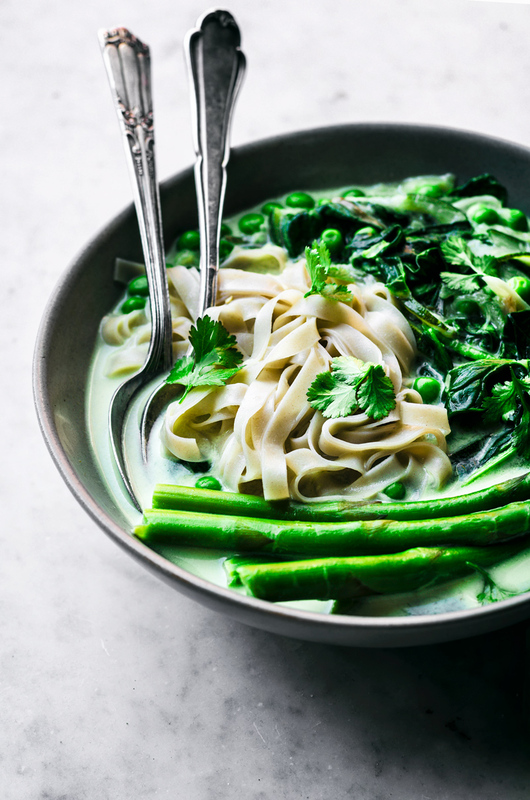 • To make sure this moves smoothly, put the kettle on to boil for the rice noodles when you start to heat the pot, and make sure you have all of your ingredients out of the pantry/fridge before you start. * This is one recipe where light coconut milk won't make much of a difference, so use what you have. Full-fat coconut milk will have a creamier end result. ** If you have baby spinach, whole leaves are fine. For mature spinach tear the leaves into smaller pieces. I just spied brown rice noodles at the store and picked em up! I’ve not tried them yet, but it’s good to know they cook the same as white rice noodles 😀 There’s garlic and ginger in there… so I know paired with coconut milk… my mouth is already watering! Gorgeous spring bowl Alexandra!